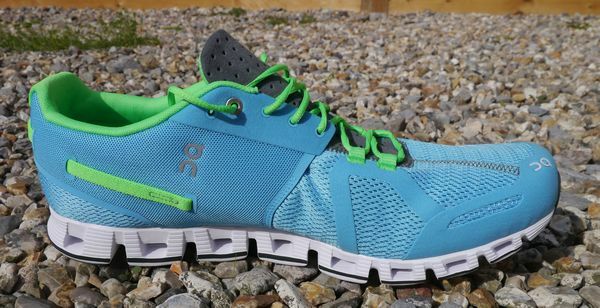 160 miles in these now, so it’s time for a review of the On Cloud running shoe. I got mine from The Run Company in Chichester. 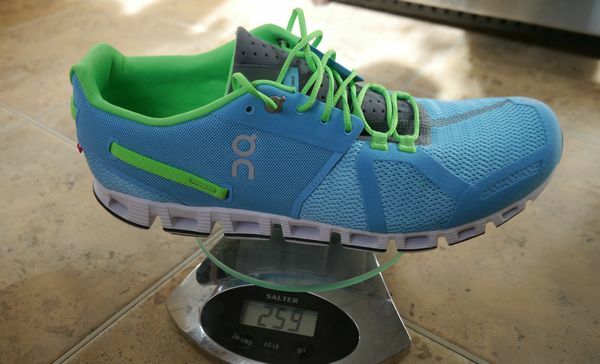 The On Cloud is a lightweight, almost minimal shoe, but with a significant cushion, for road use. On say that it adjusts to your gait due to the way the lugs on the sole all move independently, although that’s a bit hard for me to determine. Most people will be buying it for 5k to half marathon, although it should be good for the marathon distance too if you are soft on your feet. The first thing you’ll notice about the Cloud in this colourway is the bright blue with bright green highlights on the laces, heel interior and heel counter. I mean it’s seriously bright and I really didn’t want to get it dirty because I love it. Once you’ve recovered from that, you’ll see the large lug arrangement on the cushioned sole. They are a bit more rigid than previous lugs used for most of On’s shoes and are arranged in two columns with a central channel. Since they are more rigid, they provide most of the cushion and there’s no need for them to have the locking-lug device On are known for. The upper is a loose mesh at the front, so it’s a well ventilated and thus cool shoe. 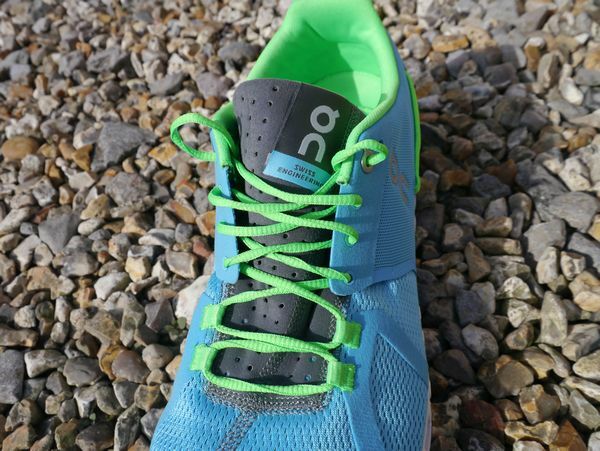 The outsole is just a layer of carbon rubber on a few of the cushion lugs. Due to the lack of ground contact and the shape, there is a little less grip than other similarly lightweight shoes (Takumi / Ekiden), but it has never caused any issue in corners, only really noticeable in the rain and encourages a strong lift of the leg rather than relying on push-off alone. On seeing the sole, my first thoughts were that it was going to catch a lot of rocks. If you venture off-road, it will do, but small bits of gravel on-road aren’t big enough to get grabbed, so if used as intended, it’s certified rock-free! The heel area has a strange loop through the material which doesn’t appear to do much, but it looks cool 🙂 (apologies to the creators if it’s like some structural mainstay without which the entire shoe would fall apart). There’s not much support apart from a shallow stiffer section (seen with the logo in the pic below), so don’t try and use them for badminton, but on the road, I prefer as little as possible, so it’s just right for me. It comes equipped in the box with elastic laces, just in the arch “cage” area, which can be tightened by adding a knot wherever you want. It also comes with traditional laces using eyelets that go down the front as-is more traditional and after playing around with the elastic ones, I decided to use the normal laces. The cage is quite soft (not like the rigid cage on something like the Energy Boost) and feels great over the top of the foot. The tongue looks like it is at a slight angle, but it’s actually just the way the On label has been shaped and applied. 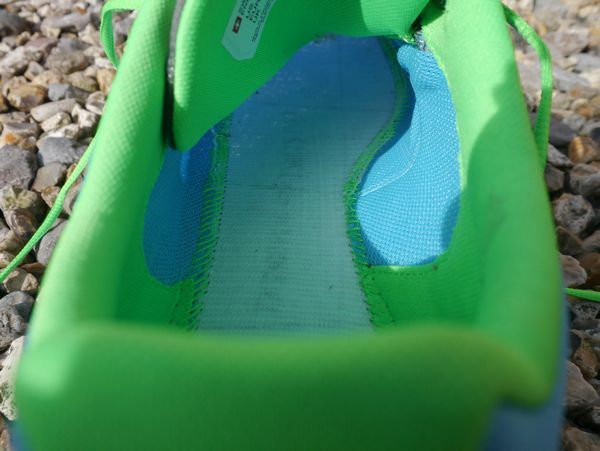 Inside the heel, it’s a bit puffy to stop debris, and there’s no unnecessary shape around the instep. There are reflective logos and the front, back and sides. My size 12 On Clouds weighed in at 259g. For something with this level of cushion, that’s good going. My first run in these (apart from the treadmill in-store) was an easy base-pace half marathon. Yes, I put them on, thought “These feel good” and ran 13 miles. It was great running in shoes this light, but with this amount of cushion, but it not’s Hoka levels of softness, so don’t get put off by the light/cushioned combo. I love the way it’s firm enough at the front so that it doesn’t fold up around the ball of the foot, instead giving an even feeling across the forefoot when lifting the foot back into the air. The speedboard that the lugs are stuck to distributes the force well across the foot. The step down from heel to toe is a little more pronounced than I prefer. On-Running state that it’s 6mm, but it feels like more and I was pleased to see that Running Warehouse measured it at 9mm (24/15), so I wasn’t going mad. This is more noticeable when walking – when running I forgot about it after a couple of miles, but it’s more than I’m used to. It would be fantastic if On could made a flat version (less at the heel, same at the forefoot), just so there shape under arch is less intrusive. This would make it a 5* shoe for me. Or at least match the 6mm promised. It’s not so much the drop, but the way it’s like a step, with the arch of the foot feeling the edge of the step. This rules it out for the longer distances for me, but a friend has done a marathon in them happily. When landing on the heels, the cushion is super comfortable – the lugs are designed to move around in all directions, so there is deceleration not just straight down, but sideways too. 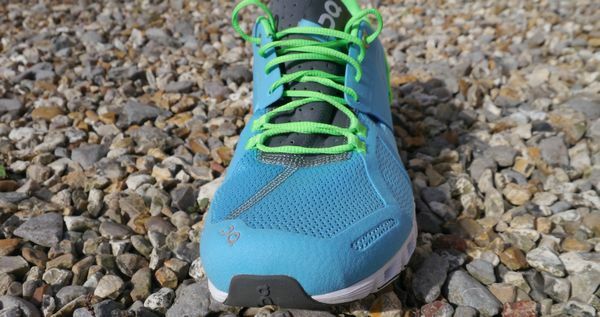 The transition from heel to forefoot is smooth, with no extra tech to break up the flow. 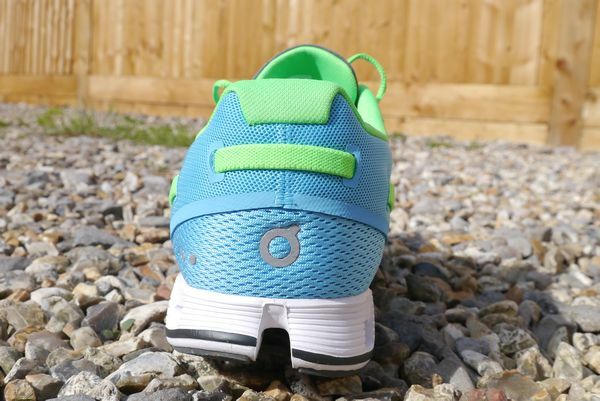 I’m normally a forefoot landing runner and because there’s less depth t0 cushion up the front, it’s firm, with less movement and a confident feeling to the landing and lift-off. But really, this shoe is designed for people landing on their heels. I went off-road, just to try, and unlike my Ekidens, you can be pretty lazy where you place your feet, not worrying about stones, because the cushion soaks it all up with ease. I’ve done a variety of runs in them now, from Threshold to long easy runs (19 miles). It was great for all of them but I’d say the longer runs were my favourite, up until the arch shape got a little much for me, and I’m looking forward to trying something like a 10 mile race at speed. Thank you for your precise comment that comforts me in the choice I made buying this model. I was participating to a marathon (making only the semi version for myself) and noticed a lot of runners wearing ON shoes while I was on Asics Nimbus.